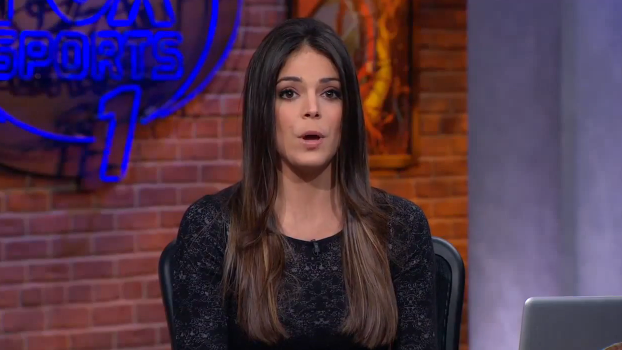 Meet Katie Nolan. She's one of the host of Fox Sports 1's Crowd Goes Wild. She also hosts the very good Fox Sports web series No Filter, and she has shown herself to be one of the bright spots of FS1's initial months. Count me in as a big fan. Also, yesterday was her birthday (fun fact). Meet Rick Reilly. He's, well, a jackass. His career has gone into the toilet since leaving Sports Illustrated for ESPN back in 2007 (it's been that long). Yesterday, after notably confusing Olympian Gabby Douglass with Gabby Giffords, the Arizona congresswoman that survived being shot in the head in January 2011, Reilly took a bizarre cheap shot at Regis Philbin, the host of Crowd Goes Wild, saying that nobody at Super Bowl Media Day knew who he was and is "the little guy in the makeup." It was a bad move by Reilly, not just because he looked like even more of a putz than he usually is, but he then got truly and efficiently eviscerated by Nolan. This is fantastic TV, let's go to the videotape. And boom goes the dynamite. Nolan was able to note all of Reilly's embarrassing moments, like badgering Stuart Scott to give him credit of a story which he did not break, misquoting his Native American father-in-law during his awful piece trying to defend the nickname, Redskin, and just being a lazy writer. In the short history of Fox Sports 1, certainly one of the best moments. For Reilly, cue Billy Madison. Will we see more outdoor NHL games in the future? So Super Bowl XLVIII is being played where?